iPing was conceived as a way for Ping fitters to fit players to the proper putter for there particular stroke type as well as a way for golfers to improve upon there putting game. It evolved into much more but fitting golfers to the right putter remains the cornerstone of the product. iPing is used around the world today as the premier putter fitting tool. It also contains a news aggregator as well as a multiplayer “skins” game built in. The Skins game can be played with a local group or group connected from anywhere in the world. This apps features run very deep, these images provide just a sample of this products capabilities. 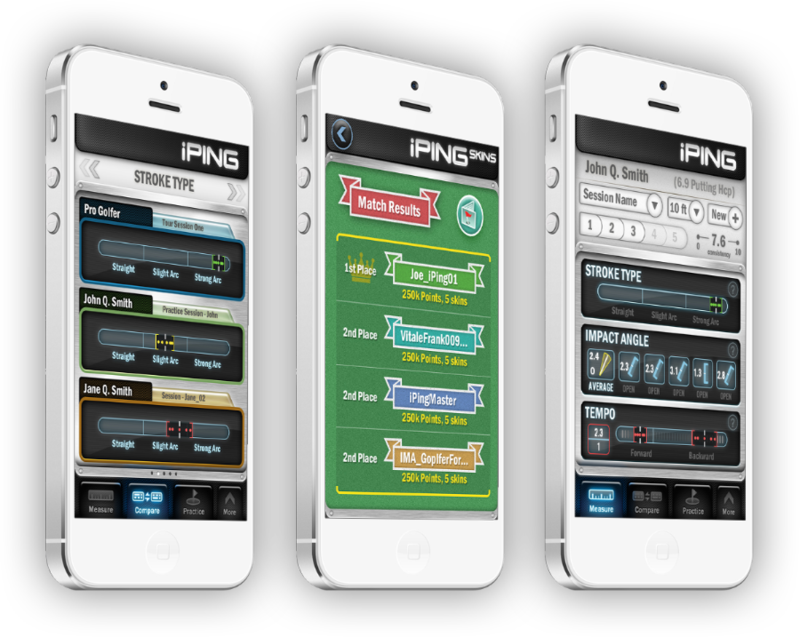 As of this time, January 2016 Ping has redesigned the iPing app. It has a new skin but still maintains it's core feature set. Above you can see the Compare screen where you can compare your score to those of the pros, the Match Results for the Skins game and the main Measure Screen, where you keep track of your Stroke Type, Impact Angle and Tempo of your swing.